The people retorted [to Jesus], "You Samaritan devil! Didn't we say all along that you were possessed by a demon?" "No," Jesus said, "I have no demon in me. For I honor my Father — and you dishonor me. And though I have no wish to glorify myself, God is going to glorify me. He is the true judge." So often we succumb to peer pressure because we let the people around us determine our worth in our own eyes. To be labeled as demonized is about as bad a criticism as one could receive if he or she is seeking to live for God. Jesus, however, wasn't fazed. He knew who determined his worth. He would not be baited into useless arguments by people who could only criticize and call him names. He lived for his Father's glory, not his own. He lived to honor God and not himself. Since his primary commitment was to please God, he was very willing to leave the determination of his worth in God's hands. This commitment allowed him to live with the freedom to be all that God had made him to be. What about you? 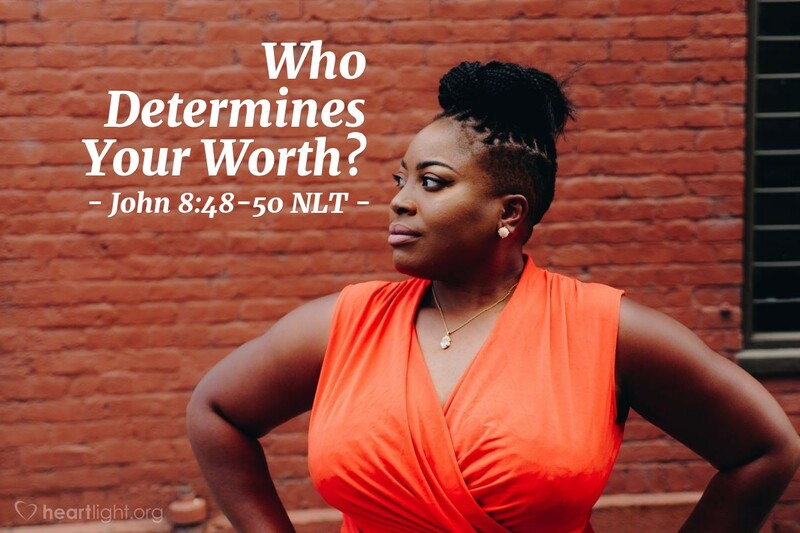 In your own eyes, who determines your worth? Father, forgive me. I sometimes let the evaluation of others mean too much to me and compromise my mission and my integrity in your work. Bless me with strength, dear LORD, as I seek to leave the determination of my worth solely in your hands so that I am not swayed by the criticism of those who would seek to derail my life's mission. In Jesus' name, I pray. Amen.